John VIII Palaiologos or Palaeologus (Greek: Ίωάννης Η' Παλαιολόγος, Iōannēs Ē' Palaiologos; 18 December 1392 – 31 October 1448) was the penultimate reigning Byzantine Emperor, ruling from 1425 to 1448. John VIII Palaiologos was the eldest son of Manuel II Palaiologos and Helena Dragaš, the daughter of the Serbian prince Constantine Dragaš. He was associated as co-emperor with his father before 1416 and became sole emperor in 1425. In June 1422, John VIII Palaiologos supervised the defense of Constantinople during a siege by Murad II, but had to accept the loss of Thessalonica, which his brother Andronikos had given to Venice in 1423. To secure protection against the Ottomans, he visited Pope Eugene IV and consented to the union of the Greek and Roman churches. The Union was ratified at the Council of Florence in 1439, which John attended with 700 followers including Patriarch Joseph II of Constantinople and George Gemistos Plethon, a Neoplatonist philosopher influential among the academics of Italy. The Union failed due to opposition in Constantinople, but through his prudent conduct towards the Ottoman Empire he succeeded in holding possession of the city. 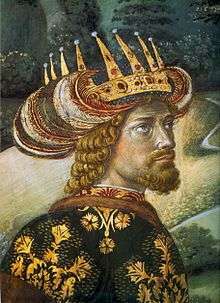 John VIII Palaiologos named his brother Constantine XI, who had served as regent in Constantinople in 1437–1439, as his successor. Despite the machinations of his younger brother Demetrios Palaiologos his mother Helena was able to secure Constantine XI's succession in 1448. John VIII died at Constantinople in 1448. John VIII Palaiologos was married three times. His first marriage was in 1414 to Anna of Moscow, daughter of Grand Prince Basil I of Moscow (1389–1425) and Sophia of Lithuania. She died in August 1417 of plague. The second marriage, arranged by his father Manuel II and Pope Martin V, was to Sophia of Montferrat in 1421. She was a daughter of Theodore II, Marquess of Montferrat, and his second wife Joanna of Bar. Joanna was a daughter of Robert I, Duke of Bar, and Marie Valois. Her maternal grandparents were John II of France and Bonne of Bohemia. His third marriage, arranged by the future cardinal, Bessarion, was to Maria of Trebizond in 1427. She was a daughter of Alexios IV of Trebizond and Theodora Kantakouzene. She died in the winter of 1439, also from plague. None of the marriages produced any children. John VIII Palaiologos was famously depicted by several painters on the occasion of his visit to Italy. Perhaps the most famous of his portraits is the one by Benozzo Gozzoli, on the southern wall of the Magi Chapel, at the Palazzo Medici-Riccardi, in Florence. According to some interpretations, John VIII would be also portrayed in Piero della Francesca's Flagellation. A portrait of John appears in a manuscript at the Saint Catherine's Monastery in the Sinai Peninsula. Medal of the Emperor John VIII Palaiologos during his visit to Florence, by Pisanello (1438). The legend reads, in Greek: “John the Palaiologos, basileus and autokrator of the Romans”. Sketches of John VIII Palaiologos during his visit at the Council of Florence in 1438, by Pisanello. John VIII as Pontius Pilatus in Piero della Francesca's Flagellation. Oxford Dictionary of Byzantium, 1991. Wikimedia Commons has media related to Ioannes VIII Palaiologos. Kolditz, Sebastian, Johannes VIII. Palaiologos und das Konzil von Ferrara-Florenz (1438/39). 2 Vol., Stuttgart: Anton Hiersemann Verlag 2013-2014, ISBN 978-3-7772-1319-4.